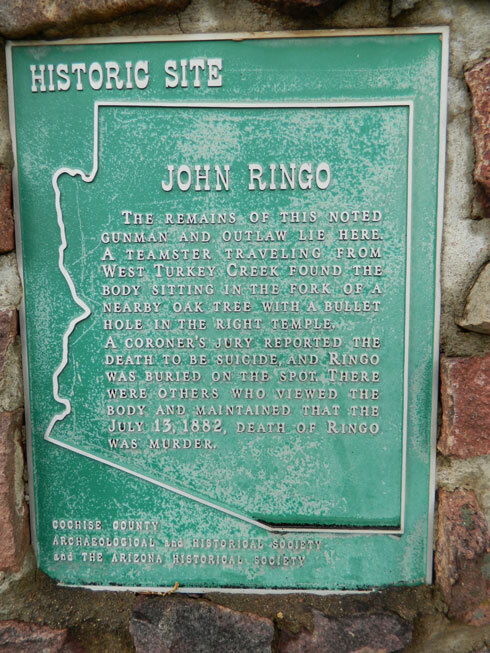 The Historic Site Monument at the Ringo Gravesite. If you’ve read about the untamed American frontier and have never heard of Tombstone, Arizona, for shame! This little town is a great place to learn about frontier life in a mining boom town. Tombstone is rife with legends and stories that would keep anyone interested for weeks on end. It was a silver mining town known for its rough-around-the-edges citizens. Names like Wyatt Earp, Curly Bill Brocius, Big Nose Kate, Doc Holliday– are a dime a dozen in the annals of Tombstone history. Tombstone is noted for the longest poker game in history (8 years, 5 months, and 3 days) and the infamous gunfight at the O.K. corral which was primarily between the Earps and the Clantons and McLowerys. Part of the culture of the “Wild West” was to bury a body along the trail where the person passed away. There was no transporting the body anywhere unless the deceased was close to the rail lines at their time of death. Decomposition was rapid because food didn’t have preservatives and embalming was still in its infancy. Bodies still relatively intact that were found on the trail were buried deep enough to keep the coyotes, vultures or other desert scavengers at bay. Most makeshift graves were covered with rocks and marked with a simple wooden cross near the place the body was found and buried. The practice of leaving a cross or headstone is still observed in parts of the American southwest– though, the bodies are typically transported and interred in an actual cemetery instead of beside the road. In September of 2004, I was on an epic road trip back east with my (good) college roommates. Three of us were bridesmaids in a fourth roommate’s wedding. After a week doing wedding activities, after our newlywed friend absconded on her honeymoon, the three of us toured the east. We saw a lot of things and had a lot of fun. We each picked a main place to visit and planned a trip around that place. One of us REALLY wanted to go to Cape Cod, so we did. Earlier that day– Wednesday, September 21, 2005– we’d been in Salem, and then we’d eaten dinner at the Outback Steakhouse near Salem. By the time we got out to the cape, it was really dark. We randomly selected a place to stay from a AAA book. The place we chose was really nice. We really loved our stay there. It’s a charming, well-priced, friendly location on the cape. As we pulled up to the motel, we drove by a cemetery. As we were checking into the room, I jokingly said, “I’ll bet the neighbors are quiet.” The owner gave a chuckle and handed us the keys. The following is a story one of my new coworkers has shared with me. I’ve been given a written copy to share, and I hope you enjoy reading it as much as I did. Enjoy! I met Todd Apel upon my return to Phoenix from Louisiana in April of 1964. We met in 4th Grade and were fast friends until his very early and untimely death on Christmas Eve in 1969. His father was driving and rear-ended a big truck. Todd and his sister Debbie were both killed instantly. The years passed and I was working the swing shift at Arizona MVD. I returned home at 1 am on Wednesday morning. I made myself a peanut butter and jelly sandwich with a glass of milk. I sat down on the living room couch to eat and relax, when I saw a dim light down the hallway. I thought one of my parents had awoken and went to the bathroom, but I heard no sound. The light slowly grew brighter and moved towards me as it did so. I began to get concerned as to what this was all about– maybe a bad guy was sneaking back out after doing something he should not have done. The light got brighter but still no sound at all. Then it happened– I saw what was causing the light– it was a pair of feet and lower legs that were glowing with a bright white light. I saw the feet and legs first because I was looking at the floor when they first appeared in the hallway. The legs were very slowly approaching me in a manner which indicated a reluctance to be seen. Then I saw the hips and the torso come into view. The “image” was stopping and then slowly advancing again. He was very reluctant to come into full view. I love Halloween, and it’s rather obvious. I like to think of Halloween as kick-starting Christmas. It’s a time for giving (candy and toys), for socializing with friends and family, and also for telling spooky stories. It’s the pre-game to my Christmas “Football”. I talk about ghosts and mysteries and murder. I start planning my costume and what I’m going to do up to 8 months in advance. When I walk through a haunted house, it’s like someone else walking through a museum. I just love this holiday. So– How did I get into this stuff? The body paint tutorials by Lex at MadeYewLook on YouTube are fantastic. Some of them are downright creepy and hauntingly fun. She has videos for everything from zombie bites, pop-culture horror characters, Monster High Dolls, and some really wickedly awesome ideas if you’re looking for some last-minute costume ideas. While I was transfixed watching almost all her videos in a little over a week, my favorites were her Pumpkin King and Cheshire Cat from the video game Alice. Wonderful creations! One of my new co-workers suggested that I read H.P. Lovecraft. The reason I was given was that as someone who loves horror, I just might enjoy it. Fancy that just 24 hours after this conversation, I read this article with links to ebooks and PDF files that are downloadable to read the works of this master of the macabre! When one unfortunate event begins a series of tragic coincidences it has the tendency to evolve into a curse. The more coincidences that are involved, the more likely people are to believe otherworldly factors have come into play– the circumstances are just too unwieldy to be anything but the result of a curse! A series of tragic events that link back to the death of a young up-and-coming actor have managed to achieve a level of curse that only a series of coincidence of this magnitude can afford. James Byron Dean lived life in the fast lane, so it comes as no surprise that this “Rebel Without a Cause” spent his last moments of life behind the wheel of a car.